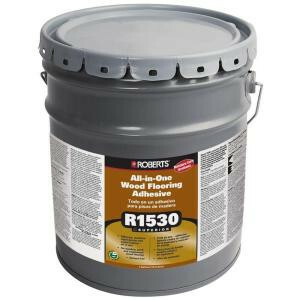 Roberts is a solvent free 100% moisture cure urethane adhesive glue that performs as an all-in-one, single application adhesive, moisture vapor barrier and sound reducer for wood and bamboo flooring installations. It helps to protect against unforeseen moisture vapors that can destroy a wood flooring installation. It also provides crack isolation for cracks up to 1/8 in. thick.